St Andrew's Cathedral Singapore is the country's largest Cathedral, and is the mother church of the Diocese of Singapore. The West Gallery originally housed a three manual and pedal organ by JW Walker, rebuilt in the early 20th Century by Hill, Norman & Beard. However the instrument fell victim to the notorious humidity of the region and had lain disused for many years. 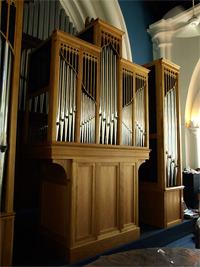 In 2008 MPOS was commissioned to design and build a new case, including 8 ranks of pipes, to be combined with the Cathedral's custom built four manual Rodgers console. In addition to some new pipework, the design also incorporates several ranks of pipes from the original organ which have been restored and carefully rescaled by MPOS. The case also contains the large multi-channel Rodgers speaker system which projects the digital stops. The case, chests and wind systems are constructed from the highest grade components, including marine-grade timbers, to cope with Singapore's extreme climate. Direct electric action is used to give the highest speed of response, as well as to provide long term reliability and serviceability. MPOS installed the new instrument on schedule before Easter 2009, with tonal finishing of both pipe and digital components carried out by David Wilson (Tonal Consultant for MPOS) in collaboration with Rodgers Singapore agent Mr Lim Chin Kai. By combining the historic pipework with the Rodgers organ MPOS were able to produce an instrument to enhance the musical worship of the Cathedral.